Gaff Point offers dramatic ocean views and connects to a series of critical beaches and dune systems. The rustic trails of this nature preserve wind through cool, quiet forests and along the ever-changing edge of the sea. The beauty and accessibility of Gaff Point make it a favoured destination for local residents and visitors alike. 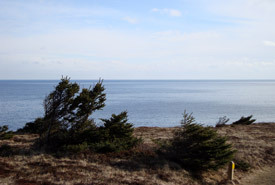 Located on Nova Scotia's popular South Shore, Gaff Point is a pristine, spectacularly beautiful headland. The property consists of impressive cliffs, conifer forest, heaths and grasslands. The Nature Conservancy of Canada (NCC) has protected this important natural area in partnership with two other organizations. Gaff Point hosts a variety of wildlife species in its marine, terrestrial and wetland ecosystems. Its coastal habitats are an ideal place for hiking, bird watching, photography and outdoor learning. In the bays surrounding Gaff Point, sea birds, whales and seals can be seen. It is a wonderful place to connect with nature. Gaff Point is a crucial element in the larger coastal landscape of this region. As the link between two protected beach-dune systems, it unifies these habitats. It also plays an important role in supporting the biodiversity of the surrounding area. The conserved land more than doubles the protected area at this site. NCC is working in partnership with a local organization, the Kingsburg Coastal Conservancy, to care for the ecologically sensitive lands under our protection through our stewardship program. Through collaborations with the local community it is possible to conserve species, sites and habitats for the long term. This conservation work helps minimize damage caused by human disturbance while still allowing the public to access beautiful Gaff Point. NCC's goal is to maintain this magnificent headland as a nature preserve for the protection of biological diversity, special beauty and educational interest, and as part of a natural heritage legacy for all Nova Scotians.